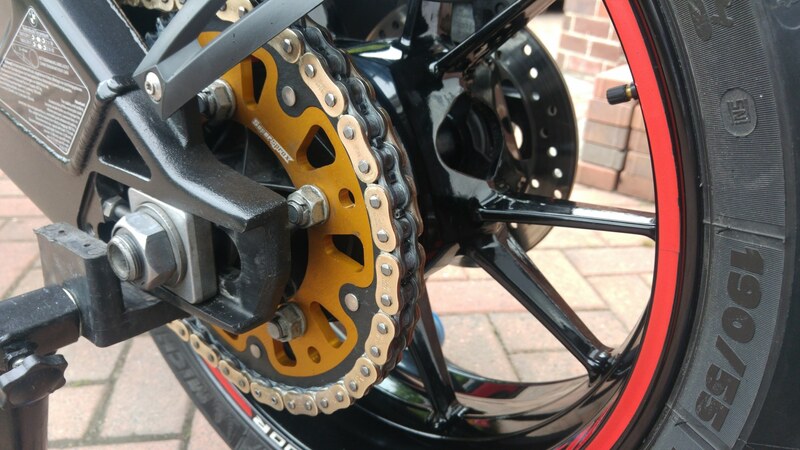 I wish I hadn't bothered washing mine, by the time I got to Assen she was filthy! Ended up having to find a car wash in France, then again in Holland; all was good in the end! The worse part was parking her on top of an ants nest at Assen (under the solar panels) then finding ants in my helmet on the ride back at 130kph! finding ants in my helmet on the ride back at 130kph! Reminds of a time a few years back on a Spanish trackday. Guy pulls off the track and practically throws his bike against the tyre wall. Pulls off his helmet and throws it on the ground. He had left his helmet on the floor of the pit garage overnight and was rewarded on the back straight with a huge poisonous centipede crawling across his face! They had to pour boiling water into his helmet to get the bugger out. I was told it was 12 inches long. Since then I am always real careful where I leave my helmet even in the UK. Creepy crawlies in the ear mid corner are not welcome! 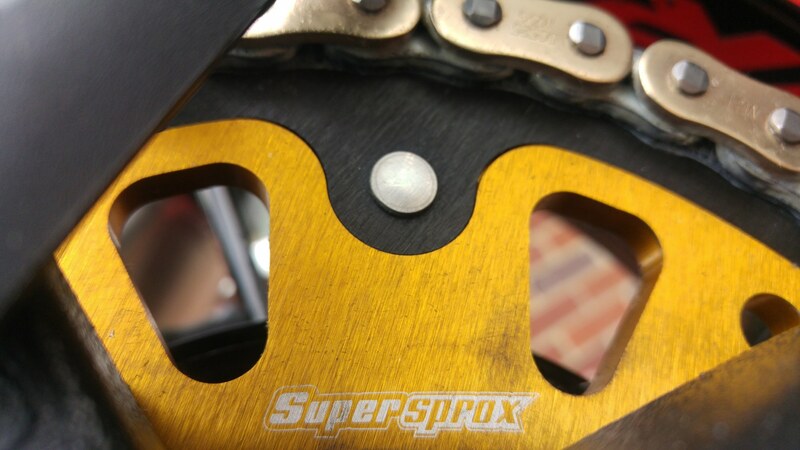 Fitted Supersprox 45T Gold rear, Standard front socket & DC Xring Gold chain. Took the links down from 120 to 118. Looks beautiful & a great upgrade from the OEM. Mine were very worn & covered 14,500 miles. Installed some Rim Stripes I got on eBay. Easy install and turned out great. Oh and because it rained and couldn't take bike out, I polished the hideous cat and exhaust pipes with Autosyl!! How does the cat look? Mine has 1200 dry miles but looks shocking. Much better..not sure photo does it justice but really does'nt take long..